In this issue: President's Message, Convention 2017, Wounded Warrior In Action Hunt Sponsor, ODNR Night Vision, Website Award, Fundraiser Preview, Board Election Announcement, AWLS, and Family Fun Day Announcement. In this issue: President's Message, Convention 2017, Wounded Warrior In Action Hunt Sponsor, Hunters pay it Forward, Turkey Care Program, Website Award, Christmas Party, Youth Pheasant Hunt, Fundraiser Update, Hunting Photos and Stories, and Meeting Information. In this issue: President's Message, Lion Donation, Sensory Safari for Visually Impaired, Sportsman's Alliance Rally, Range Dedication, Chapter Shoot, Hunting Photos and Stories, Presidential Election Editorial, and Meeting Information. In this issue: President's Message, Sportsman's Alliance Rally, Range Dedication, Chapter Shoot, Wounded Warriors in Action (WWIA), Turn in a Poacher (TIP), Ohio Background Check Requirements, Hunting Photos and Stories, Trump vs Clinton on Gun Rights, Sensory Safari Trailer, Deerasic Classic Photos and Meeting Information. In this issue: President's Message, Monthly Meeting May 19th, Board Member Election, By-Law Update, Fundraiser Pictures, Fundraiser Report, American Wilderness Leadership School Sponsor Winners, Metzger Receives Presidents Award, Protecting Rivers and Streams from Litter Dumping. Annual Gun Swap, Gun Giveaway. In this issue: President's Message, Guest Speaker, Monthly Meeting November 19th, The Blue Bag Program, Youth Pheasant Hunt, Throw Back Photo Jerry Stohlman and Mark Metzger, John Kercheck Cape Buffalo, Cabela's Discount, Cooks Corner Pulled Venison Sandwich, Hunting Humor. In this issue: President's Message, Guest Speaker, Monthly Meeting September 17th, The Wilds Science Camp, Sensory Safari, Throw Back Photo, George Quigly Jr, Olympic Team Shooter, John Kercheck Cape Buffalo, Airline Ban on Trophy Shipments, Chapter Shoot, AWLS, Leadership Training. In this issue: Chapter Shoot Information, Tom Thomas President's Message, Attendance Gun Raffle, Annual Gun Swap, Chapter Fundraiser Pictures, Hob Camp / Warren County 4-H Sharpe's Shooter 50 Yard Shooting Range Donated by the Fiedeldey Family, Bald Eagle Shooting, AWLS Sponsor Kimberly Beard, The Wilds' Science Camp, Board Member Elections, Dalton Stohlman Trapping, and Alexis Russian Boar. . 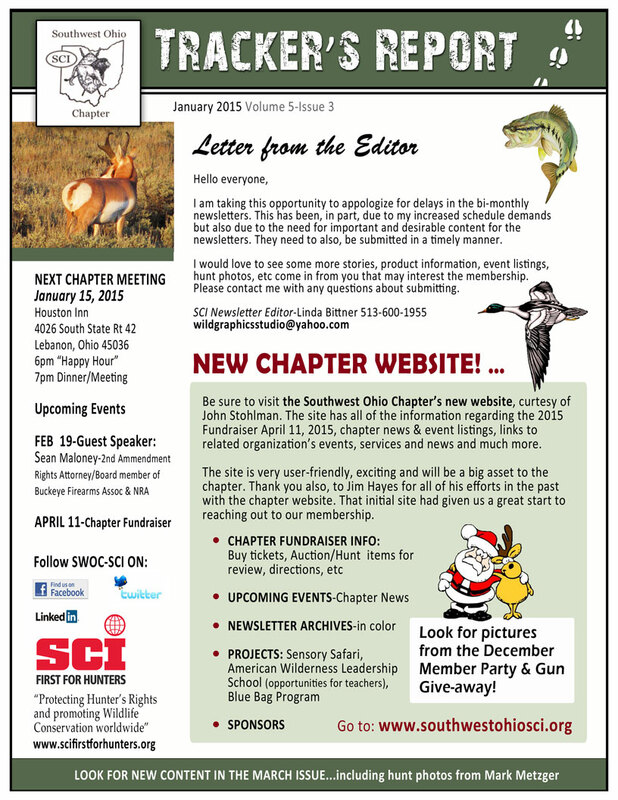 In this issue: Letter from the Editor, Guest Speakers Sean Mloney - 2nd Amendment Rights Attorney, New Chapter Website, January Membership Meeting Information, Chapter Fundraiser Information, December Party. In this issue: President's Message, Special Guest Speakers Linda Bittner and Whitey Howard, Sensory Safari Update, HisPins Archery Program, Dalton Stohlman's Buck, and Save Maine's Bear Hunt Donation. In this issue: President's Message, Get Kids Outside, Board Member Elections, Fundraiser Highlights, Member Spotlight Spring Fishing, Fishing Tips and Tricks. In this issue: President's Message, Gun Swap, Turkey Time, Dalton Stohlman Trapping Photo, Hunter Bennett African Safari Photos, Dave Izor Red Deer and Mule Deer Photos, Fundraiser Highlights, Turkey Recipe, Sensory Safari Trailer. In this issue: President's Message, Special Guest Speaker Julie Bittner, New Member Gun Drawing, Member Spotlight, Gun Swap, Sponsor Spotlight. In this issue: President's Message, Special Guest Speaker Russ Doyle Cincinnati Zoo African Exhibit, Hunting Tips, Member Spotlight, Sponsor Spotlight, Hunters from the Past, December Party, Logo Knives. In this issue: President's Message, Special Guest Speakers, Don Boling Farmers and Hunter Feed the Hungry, Take Young Person Hunting, Ohio Sportsmen's Reception, Bittner Family at Target Shoot, Archery Hunting Tips, 4-H Shooting Sports Donation, Safari Cares. In this issue: President's Message, Special Guest Speakers Ron Olt Ohio DNR TIP Program, Hunting Tips, Member Spotlight, Sponsor Spotlight, What's Cooking?, 4-H Shooting Sports Donation, Archery Team Sponsor, Sensory Safari Trailer Request, Metzger Hunt Photos, Big Bore Shoot, Membership Renewal, Wild Art Safaris. In this issue: President's Message, Gun Raffle for Members, Member Spotlight, Fundraiser Photos, Luxus Discount, Members Only Forum, Chapter Outing. In this issue: President's Message, Gun Swap, Membership Gun Givaway, Special Guest Speaker Matt Case of Wetherby and Leupold, Member Spotlight, Cabela's Raffle, Member Luxus Discount. In this issue: President's Message, Special Guest Speakers Bill Cacciolfi and Dr. Greg McDonald The Elephant in the Living Room, Waterfowl Hunting Tip, Member Gun Swap, Member Spotlight, Chapter Fundraiser.